Ridin Candy in H-Town, originally uploaded by ahughes3. A post here a while back had some video of “slabs” in Houston. Here is a great set called Slab Sunday Off MLK: Pulled up on a mini slab holiday at the Shell gas station by 610 and MLK blvd. in Houston, TX.” The image above and the image below are from that set. The bottom one is from another set of slab pix. Candy Blue w/ neon glow, originally uploaded by ahughes3. Monte Carlo Classic, originally uploaded by ahughes3. 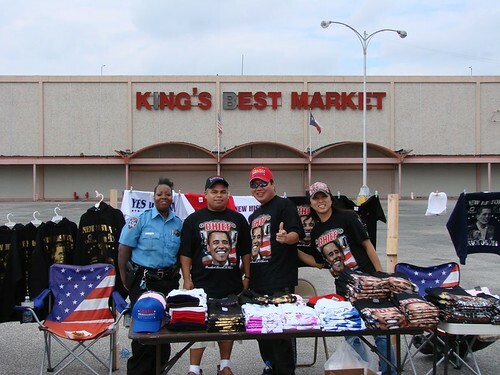 KIng’s Best and Obama T-Shirts, originally uploaded by rhaaga. The rap soundtrack backing this video of souped-up/tricked-out car gathering, evidently on Houston’s MLK Blvd., contains assorted profanities. So proceed at your own discretion. Couple more short videos after the jump.